The identity of the the maker T.I. between escallops, a leading 17th-century silversmith long remained a mystery, until the 1975 appearance of a pair of silver jugs firmly associated the mark with Thomas Jenkins. Jenkins's career was long and varied, his working dates spanning 1668-1703; his works ranged from plain and weighty tankards to elaborately chased cagework cups and garnitures. Jenkins presumably employed a number of journeymen, and later in his career served largely as a retailer, evidenced by his mark overstriking the work of Huguenot craftsmen. Jenkins's work is known for its attention to detail, use of cast elements, good gauge, and adaptability to newer styles. In the 1680s, for example, Jenkins produced numerous objects in the fashionable Chinoiserie taste, including porringers, salvers and toilet services. A 1681 Chinoiserie toilet service including eight boxes, jars and a clothes brush is illustrated in Beth Carver Wees, English, Irish and Scottish Silver at the Sterling and Francine Clark Art Institute, 1997, pp. 542-44. The service includes a jewel box similar in shape and design to the one offered in this sale as lot 284. A further group of five Chinoiserie boxes and flasks, 1682 including one flask similar to the current lot, sold from the collection of Major D. Astley at Christie's London, March 16, 1949, lot 134. 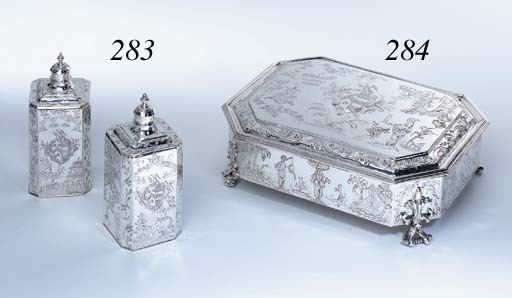 Jenkins is also known to have supplied single pieces to large services, such as a pair of silver-gilt pomade pots in 1683 for a Chinoiserie service sold at Christie's, London, May 15, 1963, lot 108 (see Arthur Grimwade and Judith Banister, "Thomas Jenkins Unveiled: A Leading Caroline Goldsmith" Connoisseur, July 1977, pp 173-81).